The selection policy for the Veterans Home International 2011 can be found here. 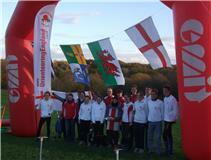 The Team Manager’s report from last weekend’s SHI can be found here. I am pleased to be able to announce the appointment of Tim Tett (SYO) as an England Junior Selector. As the parent of a Junior International and as an International himself, Tim will bring a wealth of personal experience to this appointment. England won the 2010 Senior Home International in Hampshire last weekend (6-7 Nov). Results of the relay, individual and combined team scores are here. A report from the event will follow in the next day or two.